Dentogen Clove Oil Gel provide fast pain relief from toothache. 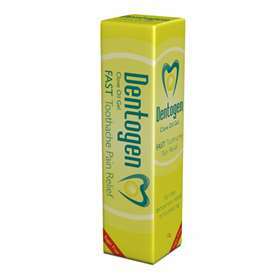 This Sugar-Free Dentogen gel is ideal for the temporary relief of toothache due to a dental cavity. Handy to keep in the bathroom cabinet. Great for the travel bag if you get caught with a bad tooth on holiday! For dental use, avoid touching the gum area or inside of mouth. Adults, the elderly and children: apply a little gel accurately to the decayed part of the tooth, using either a clean fingertip or a cottonwool bud. Repeat after 20 minutes and then every 2 hours if necessary. Not recommended for use by infants. Not to be used if an absess is suspected. Prolonged use should be avoided. Seek dental attention as soon as you are able. Active ingredient: Clove Oil 20.0w/w. Other ingredients: Carbomers, Triethanolmine, Propylene Glycol and Peppermint Essence (containing Peppermint Oil and Propylene Glycol).